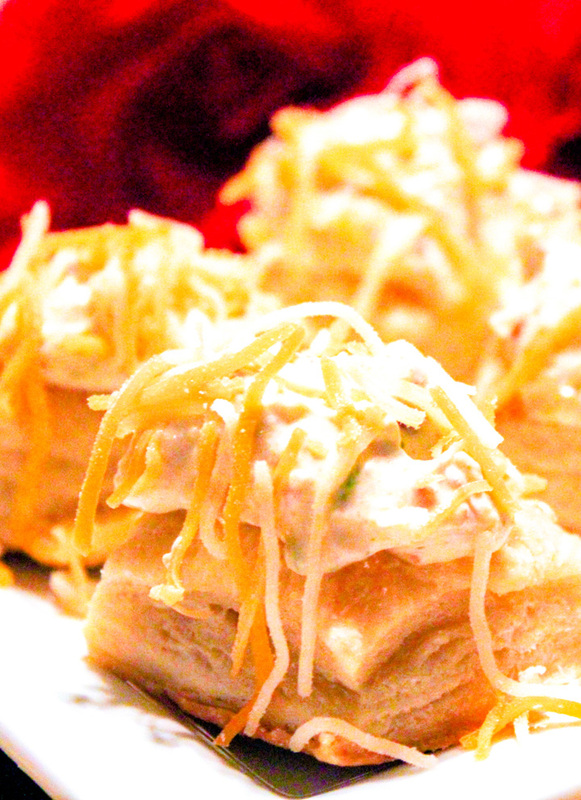 Creamy, puffy, flaky bites of tender goodness make these Ranch Bacon and Cheese Pastry Puffs the perfect appetizer recipe for any get together. Enjoy them for Valentine’s Day or any day! Oh lordy. These were good. These were REALLY good. Like, slap your momma good. Well, don’t really slap your momma, because that’s not very nice, but they are good and I really don’t know any other way to say it. Ranch Bacon and Cheese Pastry Puffs are the bomb dot com. The idea of these little bacon-ey, ranch-ey gems came from Campbell’s Kitchen but trust me when I say that in my kitchen, they took on a life of their own as most things do. We’ve made Ranch Bacon and Cheese Pastry Puffs a handful of a times, and each time we try something different. We did make them the original way the first time, but I like the flavor of everything combined so that’s what we do now. We also add garlic. Our Ranch Bacon and Cheese Pastry Puffs are so easy, and so lovely for a special Valentine’s Appetizer or even just a snack. When cutting the dough, you could use a heart cookie cutter rather than a pizza cutter to cut squares like we did. In fact, you could do these for lots of holidays by changing cooking cutters. I really wish we had thought of that before we made the batch for these photos. They’d be super cute heart shaped. (update: We’ve made these for several holidays now, using different cooking cutters and they are excellent! Doesn’t really matter what shape they are, these Ranch Bacon and Cheese Pastry Puffs are pop in your mouth fantastic. We usually have to make a double batch NOT just because we’re a big family, but because we can’t stop eating them. Happy Valentine’s Day to you and yours. Don’t forget, it’s a day for loving others – not just some significant other – it’s a day for loving all those close to you and celebrating that relationship. That’s what we’ll be doing! 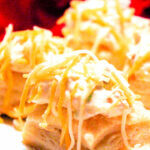 Check out the other great recipes for Valentine’s Day! 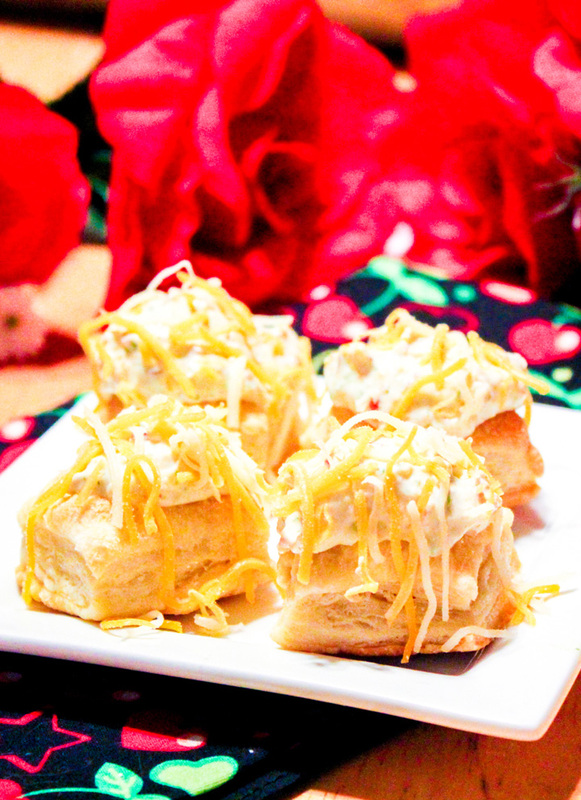 Creamy, puffy, flaky bites of tender goodness make these Ranch Bacon and Cheese Pastry Puffs the perfect appetizer recipe for any get together. Enjoy them for Valentine's Day or any day! Unroll 1 of the pastry sheets on a lightly floured flat surface. Use a rolling pin, roll the pastry sheet out into a large 12 x 12 inch square. You need to make them at least 2" squares - so you'll wind up with 36 squares from one sheet. Trust me, don't make them too small or they won't be able to hold the yummy topping. Now repeat with the 2nd pastry sheet. You will wind up with 72 total squares. I cut mine directly on the baking sheet so I don't have to transfer anything, but if you don't, transfer them to a baking sheet now. Bake them for 8 minutes or until the pastries are golden brown. I did not follow the original directions from this point on. I popped any of the pastries that had a bubble on top. Next, in a food processor, I blended the ranch dressing, 1/2 cup of the cheese, the bacon, minced garlic and the green onions, until it was all mixed up. Just for the record, at this point, it makes fantastic dip - like for crackers, veggies, etc. AMAZING. We serve it with bread slices. Once you have everything mixed up, spoon about a 1/2 teaspoon onto each pastry. Sprinkle with the rest of the cheese. Return to the oven and bake an additional 5 minutes or until the cheese is melted. These sound and look delicious, Nicole. Appreciate the time-saving hint about cutting the pastry sheets on the baking sheets =) Your Cheese Crisps do appear as if they are guaranteed to bring a smile to any party! That is a recipe i need to try ASAP. So delicious! Yum, yum, yum. Nicole you out did yourself with this one. You’ve got all of my favorites in this one! Bacon, cheese, and ranch? You could put that on just about anything and I’d eat it but I love the crisps idea, cute! Bacon and ranch girl…the most romantic foods there are. Nice flavors and with homemade dressing, I love that! The perfect appetizer Nicole. Have a great sunday! Puff pastry, bacon, and cheese all together sounds wonderful to me. I’m made your ranch dressing too and it is so good! You had me at puff pastry and cheese! What a beautiful sentiment to conclude your post! And a fabulous recipe, too! Yum! These look like perfect party appetizers! So easy, and they sound amazing! What a great appetizer! These look flaky, fluffy, and deeeelish! I love easy dishes and puff pastry makes everything easy! Great dish! I will eat anything with puff pastry! These look amazing, yum!! Loos so tasty!! An easy to make, I should try them!! I’m going to have to try these slap-your-momma cheese crisps. They look wonderful in all their bacony goodness. oooooooo ooo I don’t know if I should make these………. because I’d want to eat ALL of them! Wowza! Nicole, these are fabulous – so simple and easy, but definitely slap-yo-mamma amazing (that made me laugh so hard – you’re awesome). Quite frankly, I love puff pastry so much I could just bake a sheet and eat it by yourself. Top it with cheese, bacon and ranch?! Heaven. oops, I meant *eat it by myself. See, I’m so distracted by your dish I can’t even think straight! Seriously, puff pastry and bacon. That’s a happy Valentine’s Day! What a fun dish! Love it! Bacon and cheese? It doesn’t get better than this! Oh yum, I would love to share those with my sweetheart!! !